Could this be the product that unites the clans? The Toraiz SP-16 looks like it will appeal to DJs and producers of all kinds different persuasions. Anyone with a passing knowledge of modern electronic music and live performance will be aware of Pioneer's stronghold over the DJ technology market, with the company's Nexus range of CD/USB players and mixers (recently updated to version 2) appearing in the majority of DJ riders and setups across the world. It seems that Pioneer is not content with dominating the DJ booth, however, and is looking to step into the competitive music production workstation marketplace with the new Toraiz SP-16, a sampler-sequencer-groovebox that's filled with features that are geared towards both the studio and live performance. With this in mind, we've come up with a quintet of reasons why the Toraiz SP-16 has the potential to change the status quo and offer something different for both for DJs and producers when it's released in the summer. The big headline is that the Toriaz SP-16 is the product of a collaboration between figureheads of the DJ and analogue synth arenas. Pioneer is making it abundantly clear that the Toraiz SP-16's dual filters have been designed and implemented by analogue synth legend Dave Smith. To our knowledge, this is the first time a major DJ tech brand has teamed up with a well-established analogue synth manufacturer in such a way. Dave's pair of filters - one a four-pole resonant low-pass filter, and the other a two-pole high-pass - come straight out of his Prophet-6 synthesizer, with the former even featuring a 'Drive' control for additional analogue character and warmth. CDJ/DJM DJs love sweeping filters and fancy effects, so these filters should be a big selling point. This could be an inspired move that inspires other dream collaborations in the industry. 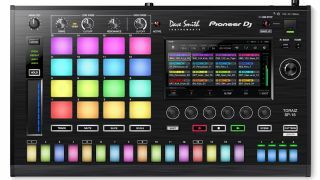 Pioneer's new sampler/sequencer could truly revolutionise the way that DJ/producers both compose and perform. Although we've seen many studio-focused standalone samplers and grooveboxes before from the likes of Elektron and Korg, plus many more laptop/hardware hybrids such as Maschine and Akai's recent MPC releases,, none of these is particularly easy to integrate into a DJ setup. The Toraiz SP-16 is a premium music creation tool that can take pride of place in your studio, but it's also created by the company that dominates the DJ market, meaning that it's been specifically designed to provide unparalleled integration within a CDJ/DJM setup. This makes it unusually versatile: use it as your core studio instrument alongside the usual computer and DAW, as an ideas 'bridge' between the studio and booth, as a sample-triggerer within your DJ sets, as a x0x-box-style drum machine/sequencer for live beat workouts, as an analogue filter box for external inputs...The list goes on. In addition to the usual MIDI clock, Pioneer's new sampler uses the company's Pro DJ Link system: connect the Toraiz SP-16 to a compatible CDJ/DJM setup (via a LAN hub) and all of your Toraiz SP-16 creations will instantly sync with your Rekordbox-synced tracks and effects. You'll be able to create grooves, loops and entire tracks in the studio or hotel room, then plug the unit straight into the DJ mixer when you get to the club and seamlessly roadtest your ideas alongside the other tracks in your set. TIme to ditch the cumbersome laptop and audio/MIDI interface? Most modern DJs fall into one of two camps: those prepared to lug a laptop, audio interface, MIDI controllers and other peripherals to the venue; and those who prefer to simply turn up, plug a USB stick into a CDJ and hit play. The Toraiz SP-16 helps bridge that gap in a way that hasn't been seen before. It's small and light enough to take on a flight as hand luggage, providing more than enough potential for creative composition and DJing alongside only a USB stick. Plus, with a whopping 8GB of storage space on board, there's plenty of room for all the various sounds you might need, and you can even load sounds directly from a USB stick - no laptop required..
Pioneer's Toraiz SP-16 quite obviously takes inspiration from the best elements of its rivals, but the end result could be a product that's far more than the sum of its parts. Wish Akai's MPC Touch didn't have to be plugged into a laptop? Want to jam out with the Roland TR-8's x0x-style step sequencer using your own pre-loaded samples? And how about a 4 x 4 RGB-backlit grid of Maschine-style velocity-sensitive pads for good measure? All of these features are here, plus plenty more. Of course, the Toraiz SP-16's high price point (£1,279/€1,599) means that you'd be able to pick up an MPC Touch, TR-8 and Maschine for the same price, but at least there's now a device that might be able to offer a best of all worlds solution.